How many times have you heard this phrase while in the startup community? This is true. This is the way of life. We learn when we fail. We push boundaries so we know where they are. This happens in our formative years. Nobody yells at us when we fall down when we’re just learning how to walk. Consequences for failure are lesser the younger you are, as it’s well understood that the older you get, the more you should know better. The problem is that the quote “embrace failure” comes from the 20/20 hindsight of extremely successful businessmen and entrepreneurs. They won. They’re okay with failure because they didn’t fail in the end. Tell someone that failure is good when they’re living paycheck to paycheck in their shoe box of an apartment, with the hair brained idea they have been working on for the past year being their only hope for redemption from their semi-estranged family and a better life for themselves and their wife/girlfriend. Tell them that while the success of their idea could literally be the difference between modest living and outright bankruptcy. So why do we keep saying these vague and vapid platitudes? For the exact same reason why Hollywood keeps producing movies with formulaic plots: we want to be able to look forward to something, even if that is only an illusion. What kind of children’s movie would be produced that didn’t give children a lesson or a hope for the future? Now the above article makes some good points regarding Turbo and Planes. I completely agree, they’re paint-by-the-numbers and vapid in their lessons, for exactly the reasons given by the article. But it also gets many characterizations completely incorrect. Mike from Monsters U does indeed aspire to be a top scarer. But in fact, the point of the story is that he simply isn’t physically cut out for it, no matter how hard he tries. But his unique talents lend themselves that he can still be part of the top scaring team by coaching and managing the top scarer. He tries ridiculously hard and still fails; he even has to live with the consequences of breaking the rules. But that doesn’t stop him from at least partially realizing his dream via the strength of his friendship with Sully and his own bookish talents. Remy from Ratatouille does not follow the article’s cut and dry outline of inspirational movies. He has an innate talent from the beginning: creating amazing food. He’s been working for years to hone his art, which couples with his innate talent for discovering which foods combine the best. What he has to overcome is the discrimination due to his being a rat. Alfredo Linguini, on the other hand, has always been a bad cook, and fails again and again to become a better cook. But when they combine, Remy’s natural talents and Linguini’s …humanity give them the tools they need to become jointly famous. We also see an undertone of accepting your heritage, when Remy almost gives up to go back to being a normal rat. But the fact of the matter is that without Remy, Linguini doesn’t just keep being an amazing chef. He fails. And hard. It’s only through teamwork from Remy, Linguini, and Remy’s family, that they’re able to combine their talents and succeed. You don’t even have to look far from Planes to see that this characterization isn’t true in most pure Pixar films. Cars follows the story of Lightning McQueen, a professional racer who gets too big for his britches and must learn the value of humility and respect for his elders to reach self-fulfillment. But Lightning actually doesn’t win a single one of the 3 main races. He blows the first because of his own arrogance and ends up tying with his rival. He loses to Doc Hudson because he’s never raced on dirt before, and he drops everything and loses the final one because of a genuine respect for his elders. Again, they mischaracterize another movie in their opening argument: Wreck-It Ralph. Yes, Ralph yearns to be something more than his programming, but after going through a massive adventure through many different video game worlds, he comes to discover that all he really wanted was the respect that people gain from being the hero. In the end,he’s perfectly content to go back to being the “villain” of his own video game, because people don’t resent him for it. The community of Fix-It Felix, Jr. realize just how important Ralph is to their video game, and come to understand him as a person, rather than just an archetype. It’s a story of respect and fulfillment rather than succeeding in your initial goal. Which brings me to my last point about this supposed “cult of self-esteem” in media. I feel like the above article is attempting to malign media that makes our children feel better about themselves, as it feels that improperly prepares them for the real world. But I might ask them to consider the humble character of Mr. Rogers. He taught children this idea that self-esteem comes from within, and that they’re special for just being who they are. That’s an important lesson for media to teach children in an unforgiving world, especially when their parents may not be the ones who teach it to them. Charlie Brown exists as a reminder that we are not alone in our kindness. That just because we get stepped on by the world is no reason to stop being kind or to be cynical. Charlie Brown never stops trying to kick the ball. Some might call that stupid or naive, but I believe it’s a symbol of what the world needs the most: trust, love, and dreamers. Sure, they may fail, but they never stop dreaming, as is shown in “A Boy Named Charlie Brown”. 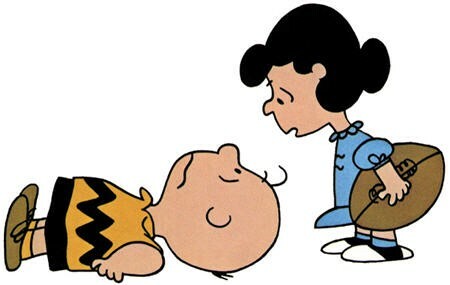 Even after Charlie Brown fails, he still attempts to punt the ball. He never stops trying, and never stops dreaming, and has enough self-esteem to not become cynical and uncaring about the world around him. Because how sad of a world would it be if every child became a cynical adult far, far too soon. Coder, Technology lover, Android enthusiast. Glass Explorer. These are my own personal tweets and don't reflect the views and opinions of my employer(s).